Si-Mag-GSH magnetic beads which are 25 um in size are specially designed and manufactured for efficient and rapid purification of glutathione S-transferase (GST) fusion proteins. This product is prepared by magnetic material cross-linked with agarose beads and the efficient separation of magnetic beads does not require high-speed centrifugation or filtration compared with the metal-chelate agarose beads. 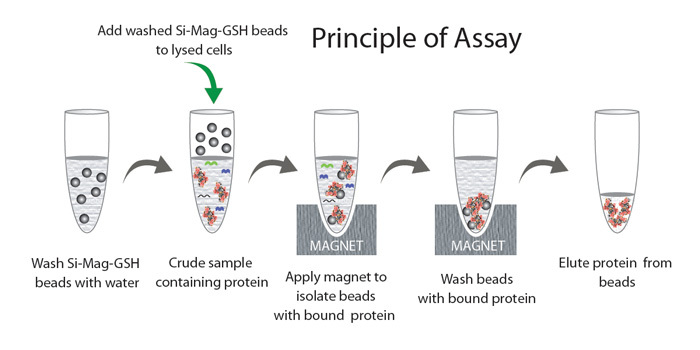 The beads can be easily separated from crude cell lysates by using magnet which greatly simplifies the purification process and improves the purification efficiency. 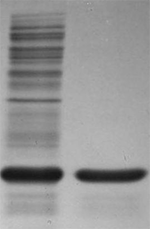 For most applications high purity target proteins can be obtained within 1 hour and the protocol can be easily adapted to high throughput, or large scale preparations reducing both time and fcost. The binding capacity of GST-fusion protein is estimated to be 10 mg per 1.0 mL of beads. Purification can be done using 96 well round bottom plates if a special magnetic frame is used. Si-Mag-GSH reagent can also be used with a variety of automatic protein extraction instruments and workstations.